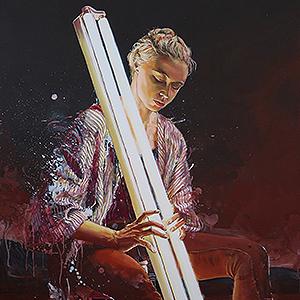 (Los Angeles, CA) – Thinkspace is pleased to present The Big Dry, its first solo exhibition ofnew works by Australian-born artist and muralist, Fintan Magee. A prolific international muralist,Magee has created architecturally scaled paintings and public interventions all over the world; over 200 murals across five continents, including pieces in Bogota, Buenos Aires, Copenhagen,London, Vienna, Los Angeles, Moscow, and Oslo, among many others. Magee draws from the personal and the social to reveal unexpected moments of universality and connection, addressing topical and current issues like climate change, environmental crisis, political inequity, loss, and displacement, all framed with pathos, sensitivity, and humor. The Big Dry will feature a series of paintings, short stories, drawings, and installations that address Magee’s personal experiences surrounding the “Millenium drought” in Australia, said to be the worst scarcity of the resource in the country’s history since its settlement in the 18th Century.The exhibition uses this personal framework to explore larger global issues such as climate change, water usage, and environmental destruction, animating these severe concerns through a localized context to make them all the more humanly relatable and immediate. Drawing links between the ongoing drought in California and that experienced by Queensland, Magee stresses the global nature of these ecological crises and the far-reaching consequences of their portents if left unheeded. The Big Dry in its consideration of loss and resource insufficiency draws further connections to sociopolitical issues such as immigration and the decline of the working classes.